The latest issue of the Automotive News Europe monthly magazine goes live on Monday, Nov. 7. 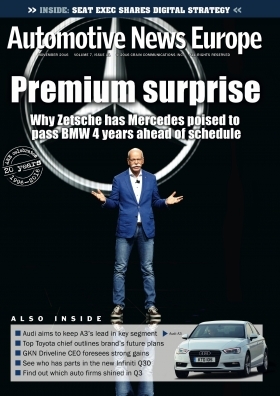 The new edition looks at how Daimler CEO Dieter Zetsche has Mercedes-Benz poised to overtake BMW and reclaim the title of world’s top-selling premium brand, achieving his target four years ahead of schedule. Zetsche recently met with Automotive News Europe to discuss how Mercedes aims to capitalize on the move toward offering electrified, connected, autonomous cars. “These developments are not happening just for technology’s sake but because you can offer something better to your customers, which ultimately is the basis for a company’s future success,” he said..